Celebrate your style at Aloft Orlando Downtown, a hip new hotel where youll be steps away from City Hall and the Amway Center. We offer easy-breezy access to major corporations, wedding venues, restaurants, museums, shopping, theme parks, and golf courses. Meet & mingle with friends at our w xyz(SM) bar, grab a sweet, savory, or healthy snack from re:fuel by Aloft(SM), our 24/7 pantry, or play in our re:mix(SM) lounge. Plus, you can always stay connected with free hotel-wide wired and wireless High Speed Internet Access! Breeze into one of our Aloft rooms, featuring our ultra-comfortable signature pillow-top bed, walk-in shower, custom amenities by Bliss Spa, and more. Our Teleadapt USB station lets you keep all your electronics charged and ready to maximize work and play. Zipping through Central Florida on a business trip or carefree vacation? 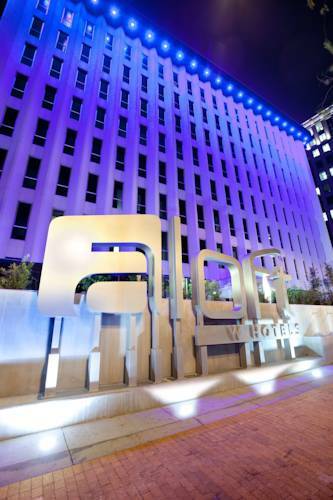 Aloft Orlando Downtown offers easy breezy access to the entire area but is light-years from all those run-of-the-mill hotels. Abuzz with the energy of discovery and interaction, this bold new lodging alternative will surely inspire you to explore nearby museums, shops, restaurants, and nightlife hotspots. Stay and play awhile! Youll discover were steps away from City Hall, the Dr. Phillips Center for the Performing Arts and the CNL Center at City Commons. Were also just a few blocks from Amway Center, home of the Orlando Magic. Need local tips? Check out Aloft Orlando Downtowns touch-screen computers in our re:mix(SM) lounge, for easy breezy Internet access to all that need-to-know info. Then ease on down the road and check out Universal Studios Orlando and Walt Disney World. Wander around to be amazed by the natural beauty of our state parks and golf courses.